Are Gerbera Daisies Perennials? The Truth Will Surprise You! / Are Gerbera Daisies Perennials? The Truth Will Surprise You! Who wouldn’t love gerbera daisies growing in their own backyard? Gerbera daisies are so perfect and colorful that they hardly look real. This flower blooms in nearly every color and produces beautifully large flowers on long, thick, and sturdy stems. 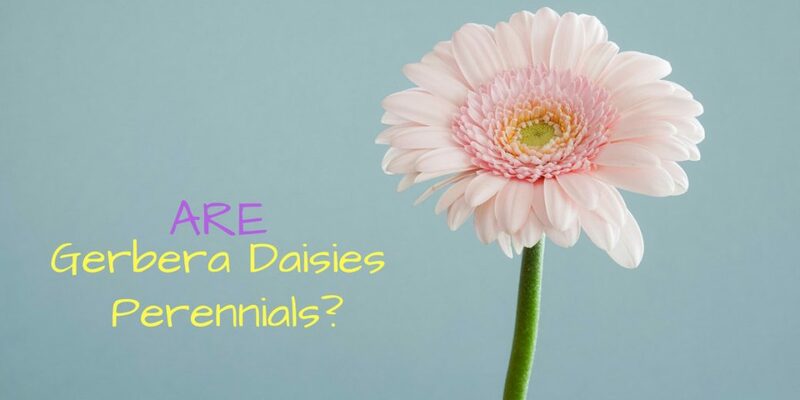 Whether you purchased the plant or received it as a gift, proper gerbera daisy care will certainly be a topic that will cross your mind. You will start to wonder whether you can grow this for one gardening season only or re-sprout it year after year. Is It a Perennial or an Annual Flower? Are You Ready to Start Growing Your Gerber Daisies? If you have tried growing them in your garden, you will know that there are certain considerations you need to make in caring for them. If you are new to this stuff, you probably have doubts about whether this flower is a perennial or an annual. Determining the answer to this query is important in ensuring proper care for the plant. Gerbera daisies can actually be treated as annuals or perennials depending on your location, climate and your commitment to the plant. So, what is the difference between an annual flower and a perennial flower? Plants can actually be classified as perennial, biennial or annual. Annual Plant: Annual plants are those plants that live for only one growing season. Basically, this type of plant grows, produce seeds and die. Examples of annual plants include zinnias and sunflowers. Biennial Plants: Biennial plants, on the other hand, are those plants that live for two growing before they produce seeds and die. Perennial Plants: Perennial plants are plants that live for more than two years. Horticulturists typically categorized perennial plants as woody plants and herbaceous plants. Woody plants include shrubs, vines, and trees whose upper parts persist over the winter season and resume their growth during springtime. Herbaceous plants, on the other hand, are non-woody plants that die back to the ground each fall. However, the roots of this type of plants survive the winter season and the plant will sprout back during springtime. According to horticulturists, gerbera daisies are considered perennials in plant hardiness zones 8, 9, and 10. However, they are considered tender perennials in zone 7. In the lower zones, gerbera daisies are considered annuals. A hardiness zone is a geographically defined area in which a distinct category of plant life is considered capable of growing. The distinction is affected by different factors like the climatic conditions, including the ability to withstand the minimum temperatures of the zone. The place where you live will ultimately dictate how to care for gerbera daisies. If you live in zones 8 to 10, this plant can be treated as a perennial in your garden. This means that you can plant the entire plant in your garden and expect for it to come back year after year. When grown as a perennial plant, your gerbera daisies will remain in the ground year after year. Once you have established plant care for gerbera daisies, they will need minimal plant care like fertilizing and regular watering. If you are fortunate, your gerbera daisies will fill out your garden spaces and give your garden more color each year. However, if you live in colder zones, you should treat your gerbera daisy as an annual flower. This flower can be grown and cared for like any other annual plants in your garden. You can allow it to die at the end of the garden season. When considered as an annual plant, you need to perform the necessary annual chores to maintain it. First, you purchase the flower seedlings, plant the seeds, and nurture the plant throughout the growing season. However, when the season is over and the plants die, you pull them out to be composted. In the following year, the same cycle begins anew. Regardless of the zone, you have to remember that gerbera daisies are susceptible to fungal diseases. Thus, it is important to note that correct planting as well as regular watering is essential for gerbera daisy care. You have to plant your gerbera daisies with adequate spacing and make sure they are planted in high light areas. Now that we have established the classification of gerbera daisies, it is high time to start growing them! Know your zone and start growing your gerbera daisies in your own backyard. When growing your own gerbera daisy, you have to take into consideration proper care for the plant. You have to nurture it and provide its basic needs. Growing gerbera daisies can have some challenges. However, seeing those big and colorful flower blooms is very rewarding. With proper care, you will likely see beautiful candy-colored flowers in no time! Help other clear their doubts about gerbera daisies. Share this article and help a friend!